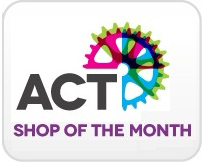 The ACT recognise one bike shop each month and award them with the title of Shop of the Month. Want to nominate a shop? If you know of a shop that deserves to be our Shop of the Month, get in touch and tell us why! If you are a shop to be considered as a future Shop of the Month you will need to be an ACT member. Make sure your promotional listing is up to date. All cycle retailers have a basic entry with the option of creating their own extended, unique, promotional listing, click here to find out more. To see previous winners of the prestigious Shop of the Month click on the years below.